Instant, crispy, filling, spicy, hot and healthy! Served with avial, jaggery, and butter – a beautiful blend of the Tamil and Malayalam food culture. Perfect breakfast for cold winter mornings. You need that sesame oil intake to keep your skin supple and moist during winter. Lentils, shallots, curry leaves, and asafetida make this a very healthy and protein-rich breakfast. 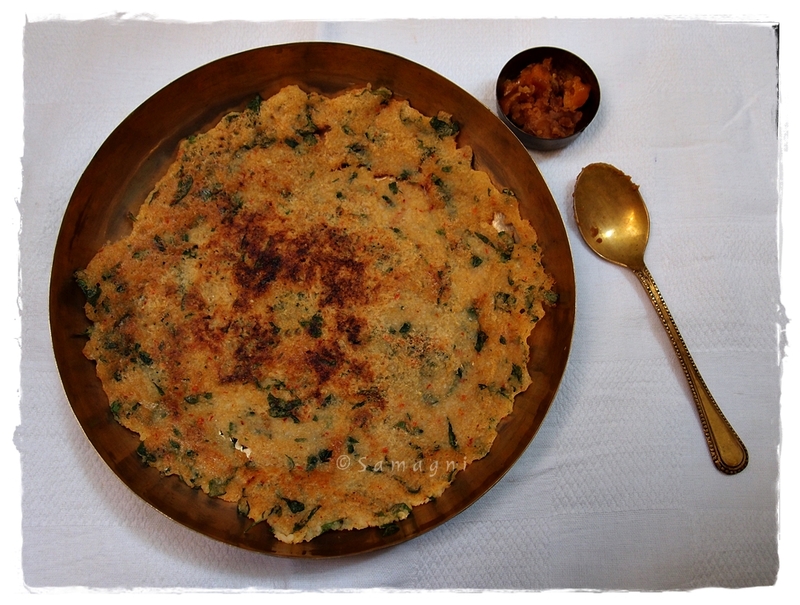 Remembering my grandmother, Rukmini, and my valiamma, Madhavi, who were famous for their special ada dosa (at home we call this varatti). Relatives who are planning to visit would inform in advance so that my aunt can prepare and be ready with the batter. Both and grandma and valiamma wouldn’t use a ladle to spread the thick batter on the hot dosa tava. They would spread it with their hand. I think their love found way into the food also! (for batter): 10 min, previous night. Shallots – Onion can be used but does not give the same taste. Shallots can be substituted with asafoetida also. Black gram – White urad dal can be used and does not affect the taste. Wash and soak the raw rice, parboiled rice, and chana dal overnight. Grind the dals and rice along with shallots, red chillies, and curry leaves to make a coarse paste. Ensure that the batter is very coarse and not watery. Add salt. The trick to get the right consistency is to remove all water from the soaked rice and grind with very little water. Heat griddle and pour about a full ladle of batter on to the griddle. Spread the batter around by patting with a flat spoon to a make a circle. The fire should be on high. Add a tsp of oil around the dosai and let it cook for about a minute. Flip the dosai and cook in medium heat for another minute. Serve hot directly onto the plate! You can store this batter in the fridge for 2-3 days. 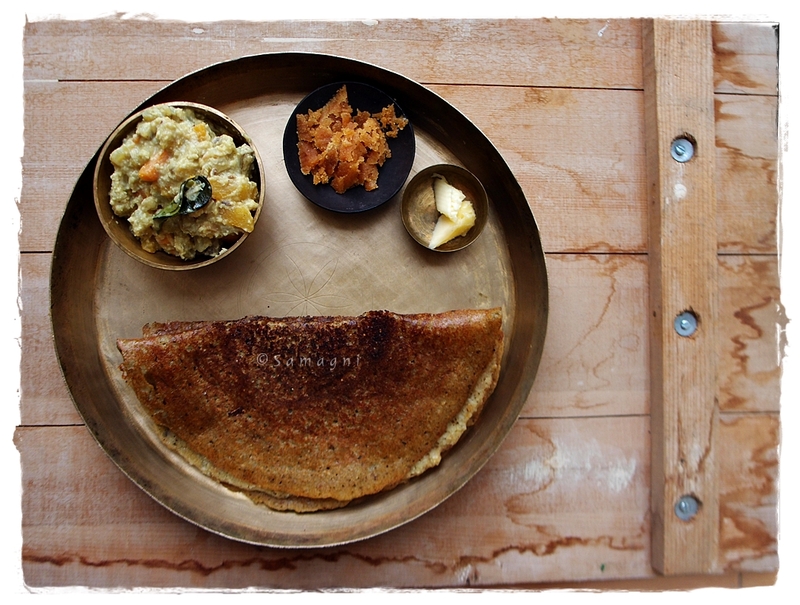 Those who prefer sour dosai can let the batter ferment for 5-6 hours and then use it. This is a very healthy diet. The use of asafoetida/shallots helps in easy digestion. Curry leaves have a great cleansing effect on the intestines. Weight watchers should watch out for the butter they eat with the Ada Dosai though! This recipe is a beautiful blend of the Tamil and Malayalam food culture. Everyone in our family, irrespective of age, has been a huge fan of Ada dosai. And all new additions to the family have come around to liking it equally well. Its all about the smell….! !